If you or a loved one have recently undergone surgery for skin cancer, you may be wondering what happens next. After all, skin cancer can be frightening. It’s completely normal to be concerned about your health. Having one case of skin cancer greatly increases your chance of developing skin cancer a second time—making preventative care and lifestyle changes important. Here, we’re sharing what you should do after a skin cancer treatment to keep your skin as healthy as possible. 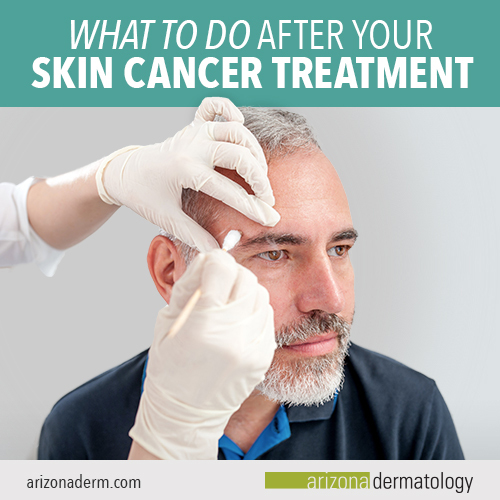 Immediately following your skin cancer treatment, your doctor will review specific aftercare instructions, including what to expect during healing and recovery. This is the perfect time to ask any questions you may have to ensure that the healing process goes smoothly. Will I have to return for follow-up care? How long until my wound heals? Will I have a scar? How can I prevent future skin cancers? Many patients with skin cancers that only cover a small area do not need a follow-up appointment. 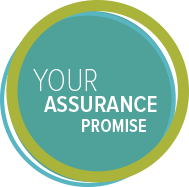 However, in the case of large areas of skin cancer, or cancers that have spread to other parts of the body, follow-up appointments may be needed to make sure the treatment worked, and the cancer has been eliminated. The side-effects you may experience following a skin cancer treatment depend on the size of the cancer you had removed, the type of skin cancer, and the amount of skin affected. For most patients with skin cancer, treatment only removes a small portion of the skin, resulting in little or no side effects. If side effects do occur, they may include bruising, redness, swelling, or bleeding. In the case of patients with cancers that cover a larger area, treatment can be more extensive and require rehabilitation or reconstructive surgery. If the cancer has spread beyond the skin, radiation or chemotherapy may be used, which may result in side effects such as fatigue, hair loss, or nausea. It’s important for everyone to wear sunscreen, and for skin cancer patients it’s even more crucial. Because exposure to the sun’s UV rays are a major cause of skin cancer, taking steps to protect yourself from the sun will greatly decrease the risk of the cancer returning. As dermatologists, we recommend wearing a sunscreen with at least SPF 30 every day, all year round, even if it’s cloudy. Along with being diligent about wearing sunscreen, we recommend the use of sun protective clothing and accessories to shield your skin. Following your skin cancer treatment, your dermatologist will schedule a number of check-ups over the months and years to come. This schedule will depend on several factors, including your age and the type of cancer you had. If you move away, make sure you establish yourself at a new dermatology practice and make your history of skin cancer known. It’s helpful to keep your medical records easily accessible, so your new dermatologist can know what form of cancer you had, how it was treated, and how long has passed since treatment. During your check-up, the dermatologist will conduct a full body exam to look for any signs of skin cancer. The dermatologist will look for symptoms such as new moles, wounds that won’t heal, and changes to your skin. These symptoms help to reveal whether skin cancer may be present. If you had basal cell carcinoma, check-ups are recommended every 6-12 months. Because this type of cancer is often slow growing, the time between check-ups may be extended if you aren’t showing any signs of the cancer returning. For the first few years, check-ups for squamous cell carcinoma are recommended every 3-6 months. After a period of one to two years, check-ups are recommended less frequently—about once a year. Certain precancerous lesions, such as actinic keratosis, can develop into squamous cell carcinoma. During your check-up a dermatologist will evaluate your skin for any signs of these lesions. Check-ups for melanoma depend on the depth of the cancer, and if it spread beyond the skin. For melanoma that was caught early, check-ups are generally recommended for every 6-12 months for several years. If these exams are normal, the time between visits may be extended. For melanoma that has spread beyond the skin, or for patients with a longer history of melanoma, check-ups can be more complex and may include imaging tests such as X-rays, PET scans, or Sentinel lymph node biopsy to ensure that the cancer has not re-emerged inside the body. Becoming familiar with your skin is one of the best ways to spot potentially cancerous changes. We recommend performing self-exams at least once a month and using a mirror to ensure you examine all areas of your body. After all, skin cancer can grow on areas of your body that are often not exposed to the sun, and interior areas such as the mouth and the ears. In general, if you notice anything abnormal about your skin during a self-exam, visit your dermatologist immediately. Skin cancer can resemble many common skin conditions, so it can be difficult to identify on your own. However, a trained dermatologist can spot the earliest signs before they become severe.